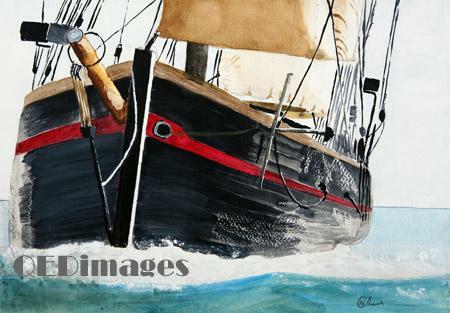 This painting became well known when it was used by the Royal National Lifeboat Institution (Patron Her Majesty the Queen) for the November picture in their Calendar titled ``Nigel Reed`s working boats``. A Brixham trawler is a type of wooden deep-sea fishing trawler first built in Brixham in Devon. England in the 19th century and was known for its high speed. The design was copied by boat builders around Britain and some were sold to fishermen in other countries on the North Sea. Brixham once had a fleet of 400 such vessels whose distinctive red sails were coated with local red ochre for protection. Only five remain afloat.